Figleaf provides the protective shielding of 1mm lead equivalency and consistently blocks a minimum of 65% of all direct-beam radiation to gonadal tissues and significantly reduces scatter to vital organ areas. Proper positioning of Figleaf places the shield's vertical line directly on the mid-sagittal line of the patient's abdomen – with the bottom edge of the shield aligned 1/2" (1.3 cm) to 3/4" (2.0 cm) above the pubic symphysis. 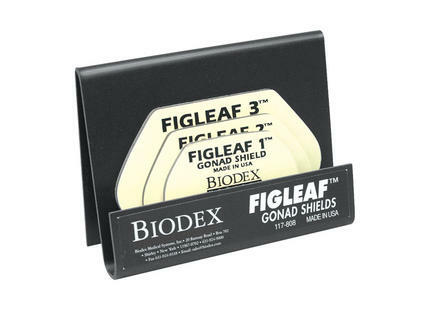 When properly positioned, the Figleaf is secured to close-fitting undergarments with microspore tape for best results.